Cisco has talked about their concept of "Unified Computing." According then-CTO Padmasree Warrior, this leads to the "next generation data center that links all resources together in a common architecture to reduce the barrier to entry for data center virtualization.... In other words, the compute and storage platform is architecturally 'unified' with the network and the virtualization platform." More simply put, Cisco wants to own the whole data center. The basis of Cisco's strategy was put in place last year with the introduction of the Nexus data-center switching platform. The Nexus is a unified switch that spans storage and computing in data centers and has security built in. The Nexus breaks new ground with its lossless switching fabric, a departure from traditional Ethernet -- though backward compatible with it. The Nexus is a monster. A single Nexus chassis will be able to handle more than 15Tbps of traffic, up from just 2Tbps for a current Catalyst 6500 switch. It could copy the entire searchable Internet in 7.5 minutes. Cisco is moving to virtualization in a big way. 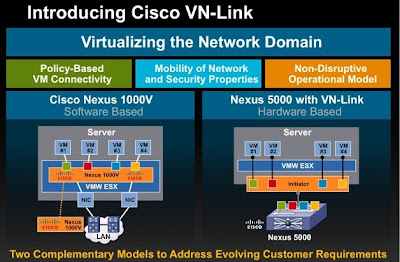 The Nexus will have Cisco's first operating system that can be fully virtualized, called NX-OS. Cisco has recently introduced the Nexus 1000V distributed virtual software switch, intended to "simplify the operations of both physical and virtual networking infrastructures to help server, virtualization and networking administration managers accelerate data center virtualization. The Nexus 1000V will extend Cisco's security, policy enforcement, automated provisioning and diagnostics features into dynamic VMware environments that will be able to scale to thousands of live virtual machines." Cisco has established a deep relationship with VMware and indeed owns a stake in the virtualization company. So let's add it up thus far. The Nexus integrates networking, storage and virtualization. What's the missing piece? Compute power, better known as servers. The expectation is that Cisco will be introducing a blade server that is optimized for virtualization. As the last piece in the data center puzzle, it is an important part of Cisco's strategy to control every aspect of the data center. This allows Cisco to expand from being a networking vendor to a broad-line IT vendor. With the company looking for new areas of growth, having a complete data center package allows Cisco to bid on contracts as lead vendor instead of merely the sub-contractor for networking gear. To differentiate themselves from other server vendors, Cisco is pushing the integration and virtualization aspects as well as management of resources. The company has said the following: "Right now, we have virtualized local area networks, virtualized storage and virtualized servers. The challenge is integrating the management of those systems so they all work seamlessly. We think the network is the logical place to solve that challenge." It is said that the new Cisco data-center blade servers will run BMC software that is key to Cisco's unified-computing concept of tightly integrating computing and network resources. Specifically, the software will reprovision network resources when virtual machine workloads are moved around. BMC is also known for asset management, service level management, change management and identity management as well as service assurance solutions that enable event management, service impact management, capacity management, and end user experience management. BMC also offers service automation solutions that manage the automation and execution of configuration changes, and IT process and task orchestration. This software suite applied the the Cisco Nexus and server solution provides an integrated methodology for managing every part of the data center. Cisco believes seamless and straightforward management is the next frontier for data centers and automating those management functions will be a strong differentiator. With Cisco recently completing a big bond offering, they are flush with cash and have indicated they are looking for acquisitions. It is no stretch of the imagination to see Cisco buying BMC or even VMware. Critics are probably correct to say that servers are a low margin business and from that narrow point of view it would seem Cisco is making a mistake. Taking the wider view, however, it is clear that Cisco is establishing a strategy and a technology stack that allows the company to move in the direction of being a prime contractor and primary hardware/software vendor for entire data centers. Servers are merely a necessary piece of that strategy. Cisco is known to plan carefully and exercise patience as they develop markets. They have a tendency toward steady growth and have shown an ability to consistently beat earnings estimates. Say what you will about these new servers but it is not generally a good idea to bet against Cisco. Cisco is the third largest corporate shareholder after EMC, who owns a majority stake (and is a significant Cisco partner), and Intel, who owns only slightly more than Cisco. The rest of the major shareholders are investment funds from companies like Fidelity and UBS.